I don't want the students in my classes to paint like me. I don't do demonstrations that you have to copy. I don't want you to paint like another artist. Even when I bring out books and images of work by other artists, I want to show different examples of principles, not encourage imitation. 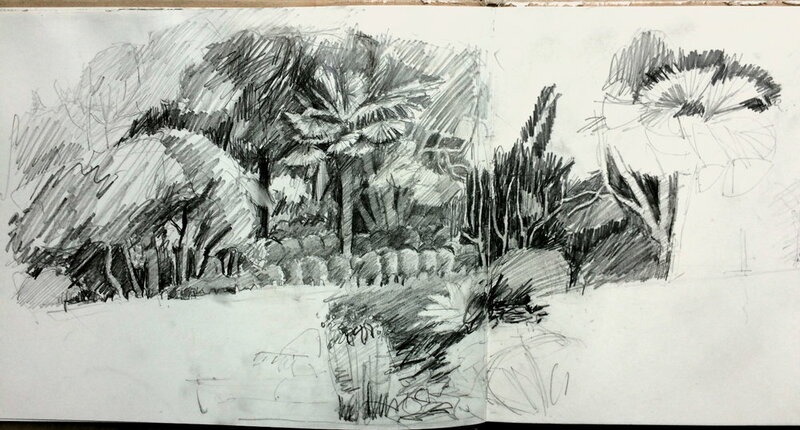 I especially don't want the people in my classes to imitate the generic watercolours in many 'how to paint' books. I want them to paint like themselves. I want you to paint like yourself. And nurturing your own way of painting takes time. It takes longer than you want it to. Someone said to me recently that surely painters have always learned by copying, transcribing and imitating great painters. Historically this is true, and certainly the case when the objective was to learn to paint like the master, the ‘great artist.’ But I'm not sure it is so relevant these days, when individuality is valued, and when the last thing you want is for someone to think or say that your work looks like a rip-off of someone else's work. Intellectual property rights have also changed since the Renaissance. I want you to gain confidence to use tonal value, colour and some interesting things about composition that go beyond the cliche of dividing the surface into thirds. Some traditions are still useful in painting, alongside the conceptual. And then I want you to practice enough to get beyond the self-consciousness. I want you to explore the connections between what you see, what you truly see, how you respond to what you see in mark-marking - 'there is nothing more abstract than reality' (Giorgio Morandi). I want you to know that it's useful to re-calibrate your visual senses occasionally by doing a carefully observed drawing, whatever kind of work you want to make. I want you to know that the artwork you imagine in your head is never the one that appears in reality, because the imagined work is an idealised fantasy. And because reality is stranger and quirkier than our imagined paintings. I want you to know that there are ways to outrun, side-step or ignore the inner critic. I want you to know that even professional and famous artists don't consistently produce their best work. That it's OK to do work that doesn't work. I want you to know that it's easier to stop working on a painting too late than too early. I want you to value every work as part of the process of becoming a painter. I want you to discover, in practice, in real time, how drawing and painting become processes of exploration, not explanation. Art is a poem not a police report (Kenneth Clark). I want you to know that artists often feel uncertain about their work, because if the art-making is alive, it will always be at the growing edge of our comfort zones. To the point, sometimes, that our work shocks us and seems unrecognisable - it's not the kind of painting we imagined we'd do. I want you to have the courage to paint through the pain of not knowing what you’re doing and not feeling confident that you’re doing it right. I want you to do enough painting that you paint through the barrier of your starting idea of what painting should look like, so that your own visual shorthand marks, characteristic shortcuts, and gestures start to appear on the painting surface. And to know that if you do enough painting, this will start to happen. And then your paintings will look like yours and not someone else's. 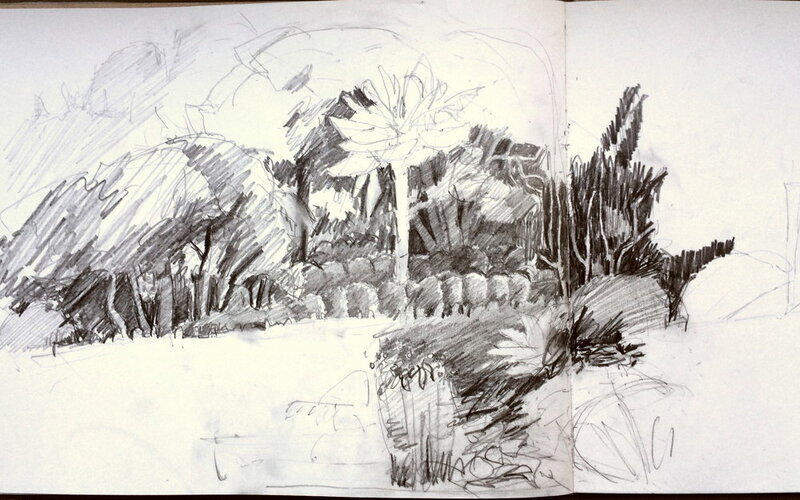 Ella Clocksin (2016) later stage of sketchbook drawing at Overbecks National Trust garden.